The Converse Chuck Taylor All Stars are amongst the all-time best sellers, with 750 million pairs sold in 144 countries. Kurt Cobain wore them. So did Snoop Dogg. Even Marty McFly donned a pair when he went back to the future. Chances are, at some point, you’ve worn them too, and if not, you’ve known someone who has. With its sleek classic black canvas exterior, stark white soles and ever-recognizable star logo, the Converse Chuck Taylor All-Star, as it is more formally known, is perhaps the best-selling shoe of all time and for good reason. Not only have Chuck Taylors managed to survive decade after decade of fads and trends, but they’ve succeeded in transcending lifestyle boundaries and appearing on the feet of everyone from basketball stars, punks and hip hop aficionados to your normal everyday student, mom and business associate. First introduced in 1917 as a basketball shoe and known as the “All Star,” this timeless shoe of choice for many was nowhere near as popular as it is now. That is until basketball player Chuck Taylor embraced them as his favorite shoe. 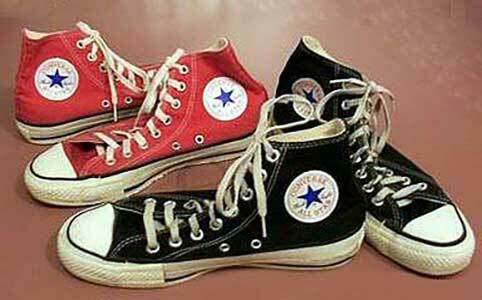 Over the years, Chuck Taylor worked vigorously as a salesman for the Converse company promoting the shoes across the United States. 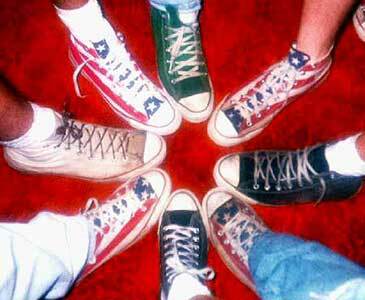 He was met with great success and Chuck Taylor All Stars continued to grow in popularity throughout the 1970s and 1980s and were adopted as the official dress code of classic punk culture. Throughout much of the 1990s, however, Converse was up against competition from shoe giants Nike and Reebok, whose ushering in of new styles and designs like the Air Jordan and the Reebok Pump, dominated the market. In early 2001, Converse filed for bankruptcy and closed its U.S. manufacturing plant while moving it overseas to Asia (and subsequently changing the fabric from cotton to textile). In 2003, Nike acquired Converse for $305 million, and eventually helped turn the shoe’s image back to the core values that made it so well-liked. When the smoke cleared, Converse, with the help of Nike, reinvented its image, went back to its classic ways and climbed back up the popularity charts to include a legion of followers and collectors, from old generations to new. Just ask Hal Peterson, creator of http://www.chucksconnection.com, a Web site loyally dedicated to the All Star that has reviews, articles, a photo gallery and even an online store where you can purchase some chucks, shoelaces, clothing and other items. Peterson’s Web site, which started out as e-mails among friends who had the same passion and shared a similar love for chucks, was meant to be a fun site, with no pop-ups or advertising. Chucks Connection eventually turned into a business opportunity, however, when it was able to get affiliate stores to sell shoes and other merchandise through the site. The shoe was introduced to the world in 1917 as a basketball shoe, and has now transcended into the world of fashion. Spanish major Luis Garcia agrees. Eliud Munguia, computer science major and friend of Garcia, said he likes the fact that they provide a great comfortability factor. Indeed, the comfortableness of the All Star is something that is agreed on across the board. “Once you get used to them, you don’t like wearing anything else,” said Peterson, whose Web site has done pieces featuring generations of All Star wearers. Photojournalism professor David Blumenkrantz, who is rarely seen without a pair on, said he agrees about the comfort they provide. For some, there are a plethora of other qualities that attract them to Chucks. Angie Castillo, English major, likes their versatility and the fact that a certain familiarity comes with them. Castillo, who considers herself an “old school type chick,” even has two pairs of the classic black Chucks. “One pair are my clean ones and the other are my dirty broken-in pair,” she said. For just around $40 a pair, Chuck Taylor All Star may be the cheapest and most long lasting shoes you will ever buy. With 750 million pairs sold in 144 countries so far, from the classic black high tops that are still considered Peterson’s favorite, to new patterns, textures, designs and even an option of customizing your own pair, rest assured Converse are not going anywhere soon, but rather are uniting lovers of these unique shoes from all different walks of life. Journalist Liana Aghajanian wrote this article for the California State University Northridge Sundial. You can reach her at Lovelylolig@comcast.net.